A quick and clean effect, just as you like it! 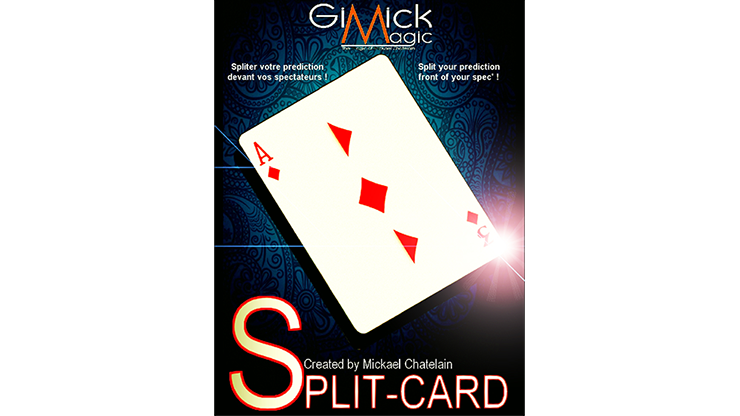 Don't wait any longer to see what you can do immediately with SPLIT-CARD! As presented at the Blackpool Convention in 2019, where SPLIT-CARD quickly SOLD OUT! Don't let this one slip by! It will DEVASTATE your spectators! Two cards are chosen by one or two spectators. Let's say they select the 2 and Ace of Diamonds. The cards are lost in the deck. Make a magic pass over the deck. Take the top card. Proudly display it to your first spectator, telling him it's his card. Just your luck! The spectator says NO! Show the card to the second spectator. He, alas, also says NO! Your trick seems to have gone horribly wrong, which will not go unnoticed by your spectators. Take the card (the 3 of Diamonds) at the tips of your fingers. Explain that if you add up the two chosen cards, your prediction is now correct, since an Ace of Diamonds plus a 2 of Diamonds give you a total of 3 of Diamonds! Ta-da! Your spectators are unlikely to be convinced by your explanation. You tell them to watch carefully this time. You hold your 3 of Diamonds right in front of their eyes. IMMEDIATELY your card splits in two! Yes! It is transformed into two cards in plain sight, one card in each hand. You have split the card into a 2 and Ace of Diamonds, the cards previously chosen. This time, your spectators can only admit that you have brought about the impossible. This effect is really strong as your spectators are taken by surprise. Just when the effect seems to have gone wrong, you save the day instantly and in full view. High VISUAL impact. Your spectators will be 100% blown away! No palming or the like. Blow on the card to split it in two. As simple as that!